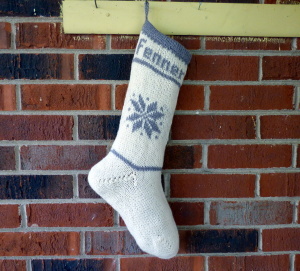 So far, all the stockings I’ve made have been requested from people I know. It has been so awesome to create what I hope will become treasured family heirlooms for these friends and family. 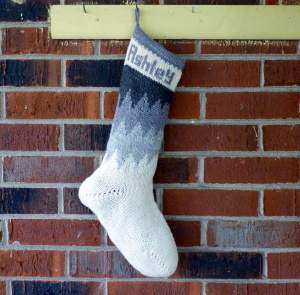 Ashley is another mama in my playgroup who asked me to make a set of stockings for her family of three. I have worried over these stockings more than I worry over anything I make for myself or my family. It’s for good reason: I want to make sure I give my customers my very best work. Generally, my motto is, “Finished is better than perfect!” but since I’m being paid for these, I feel like I should get as close to perfect as possible. In the designing process, I’ve learned, it’s helpful to think about how your design will be constructed with yarn and needles. It’s a lot different than coloring in a grid on a piece of paper. Two of these stockings ended up being more challenging to create than I anticipated when doing the design. Ashley’s stocking is a mirror image. There were a couple of places where there were only one or two stitches in a row of a different color. Rather than carrying the yarn along the whole round, I only carried it from the first stitch to the last. This made for more ends to weave in, but as we’ll see later, carrying the yarn along most of the round can lead to some interesting issues, especially when the background color is lighter than the carried color. I really like this one. It was Ashley’s idea to do the drip or flame gradient and I’m so glad she asked me to do this. I love working with an request that I get to be really creative with. I may do more of these in other colors for next year. One with shades of blue and one with green, maybe? 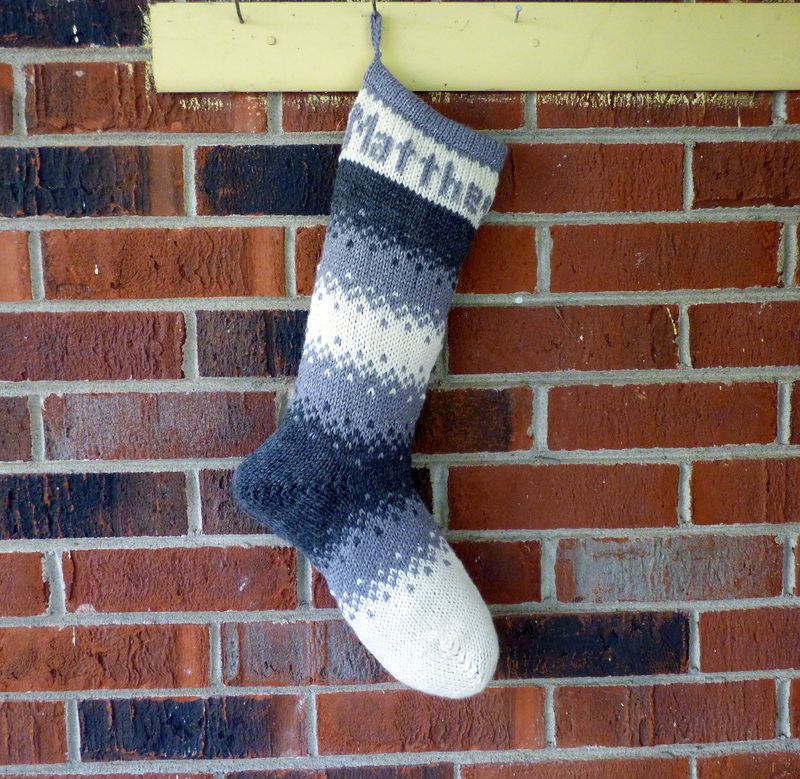 Matthew’s stocking is a variation of the green gradient I made earlier. I wasn’t able to do the big stripes from dark to lightest like I did on the green one – there just weren’t that many shades of gray available in this yarn – but I really like the way this one fades in and out. 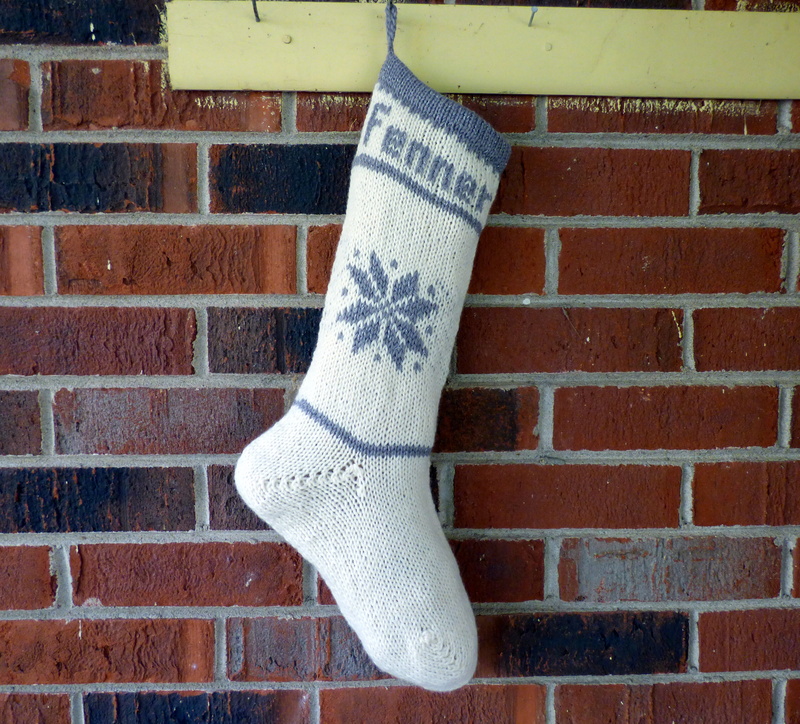 I love the simplicity of Fenner’s stocking. Very minimalist, just two colors, but the gray has just a hint of sparkle. I will definitely be making more of this design. This is one of those times in the design process that it would have been helpful to think about how the actual knitting would be done. I ended up having to redo the section with the snowflake. (I’ll post photos of that process later.) The first time, I carried the gray yarn along behind the white and it created a gray shadow in the background (you can kinda see it in this photo.) It wasn’t that noticeable from afar, but when you got in close, you could silver yarn and sparkly peeking out between some of the white stitches. I thought about it and thought about it and I just couldn’t let it go like that. I knew I could do it better and I want to make sure I sell my best work. I ended up removing the section with the star, knitting it in plain white and duplicate-stitching the star on. I am so much happier with the way it turned out and I am so glad I redid it. I really love this set of stockings. I love that they’re all different designs, but the silver sparkly ties them all together. I love the simplicity and the monochrome palette. I even love the challenges and learning opportunities these stockings gave me. It was so fun to work with Ashley and I hope that they grace her mantle for years to come. Beautiful work as always. Your skills are growing by leaps and bounds. I think this is the best set you’ve done so far! Thanks, Mom! I am really quite proud of these!